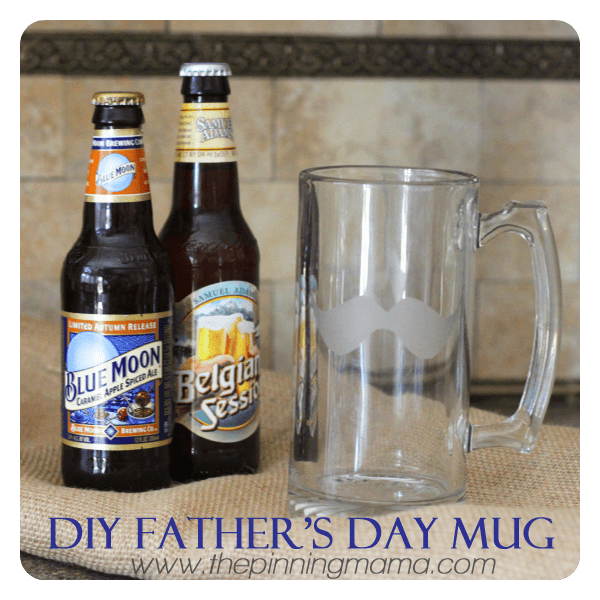 With Father’s Day quickly approaching I thought I would get a little inspiration by heading over to the dollar store and seeing what I could come up with for a fun and unique gift. Much of the time a trip to the dollar store requires lots of digging, but this time as soon as I walked in I saw these big, manly glass mugs displayed right up front and I knew that this was the craft that was going to happen! I have been wanting to try my hand at etched glass for awhile but haven’t had just the right project to try it on. 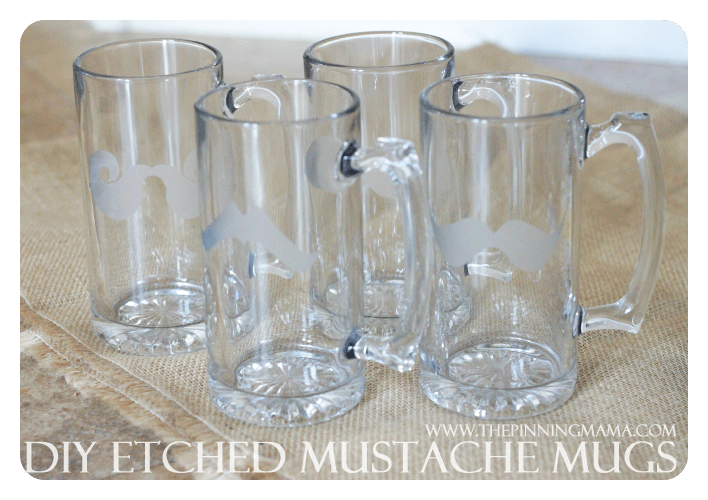 When I saw these mugs I instantly knew they were begging for a big fat mustache to be etched right on the front of it! And I mustache you…. Who doesn’t like a good mustache mug? Hehehehe, okay, cheeseiness aside the glass etching was so simple and turned out with such great results! 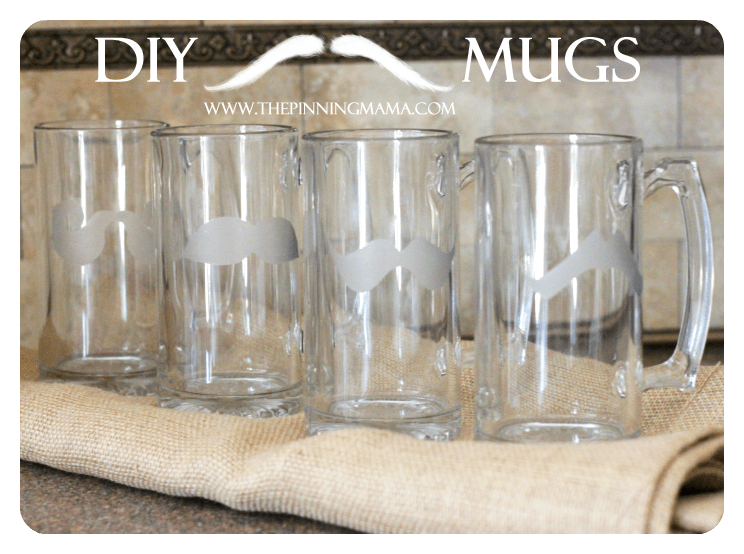 To make the etched glass mustache mugs, first find 4 mugs. I got mine for $1 each at Dollar Tree. You will want to remove any tags and clean them thoroughly to remove any lint or fingerprints. Next, I googled “Free Mustache Clip Art” and found these free mustaches from Rants and Raves. (These are vector files so if you choose to use these you will need software to be able to open and manipulate the files. I have written them and requested permission to post them here as .jpgs and will update with a download for you if I get permission) You can find all sorts of other files as well if these don’t work for you. I made my mustaches around 3.5 in long and a little thicker than they originally were. Print out your mustaches and cut them out. Next I cut contact paper squares about an inch or so bigger than my mustache on all sides. I taped the mustaches down pretty well to the contact paper and used an Exacto knife to carefully cut out the mustache. If you have a Silhouette or Cricut cutting machine I imagine it would make this step even simpler! Next carefully peel off your contact paper backing and smooth the square down where you want your etching, taking extra care to firmly press the edges around the cut out of the mustache so the etching cream will not seep underneath. I used Armour Products Glass Etching Cream that I got at Hobby Lobby. Oddly enough there are no instructions on the package so after investigating a few glass etching pins and the videos on Armour Product’s website I set out to make it happen. I spread the etching cream with a paint brush in a thick layer onto the glass. The Armour website says to let it sit a minute but after reviewing the pins I found on Pinterest about glass etching, I decided to wait closer to five and I am glad I did. At this point all you do is run the mug under warm running water to wash the cream off and deactivate it. As you can see even after sitting 5 minutes it still showed some bubbles and streaking (as you can see in the picture) so I left the contact paper exactly where it was and just repeated this step adding a thick layer of etching cream and waiting an additional 5 minutes. This time the result was PERFECT etched glass. My only word of caution here is to be careful when rinsing the mug under warm water because the contact paper can get loose if water gets under the edges and the etching cream will seep under any loose spots when you reapply. Once you rinse you mug you will want to fully wash the mugs one last time and them wrap them up for the perfect unique and handmade Father’s Day Gift. Aren’t they adorable? I love the mustaches, but this same method could be used to etch anything onto the mug. A monogram would be timeless! I also really debated doing jets for my hubby which is his career… hobby… life haha! I could see them with names, quotes, hobbies, jobs, the possibilities are endless. It is just such a quick, easy and customizable craft! Make sure you follow us on Pinterest to see more great crafts. And Like our page The Pinning Mama on Facebook to keep up with what we are cooking up next, as well as getting access to exclusive freebies only for our Facebook fans! Those turned out great & they don’t look too hard either!!! Thanks Tracy! They are super easy! You can make them with any design you can print and cut out! Cute! I like the mustache choice, too! Lol! He can’t wait until March? Super cute! And perfect for Father’s Day!! Good job and thanks for sharing! Yes!!! Thank you this will be done for Father’s Day!! Laura, Thanks for the note! 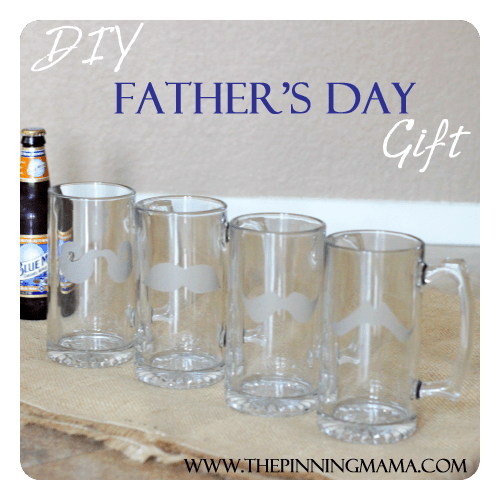 So glad we could help you with a fun and easy idea for a Father’s day gift!! Love it! I have done glasses and vases around here, love Armour Etch! Jen- It was my first time to use it but I know Ashley has used it on several projects. I love the professional look it gives! 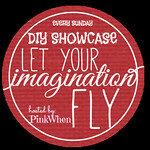 Very cool DYI gift idea! We do a lot of etched glass for our customers… this is something we will have to share with them for fathers day. Thanks you! Etched glass is so fun! 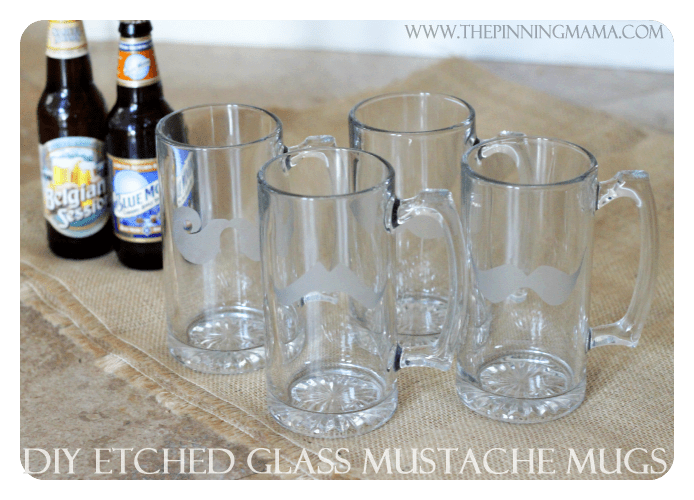 The mustaches are just awesome in general, but would make an especially great Father’s Day gift!! Thank you for sharing!